Ho! Ho! Ho! Now that it is finally December – the long awaited time for all school kids and hardworking professionals – we count the days ‘til Christmas Eve where we can relax with a big feast, great company of friends and family, and the excitement of opening our presents under the Christmas tree! So tell us, what does Christmas mean to you? Either from celebrating Christmas at home or watching festive flicks on HBO, Christmas is celebrated through all types of indulgence – a break from the mundane life, a table full of food with the turkey or roast chicken being the star of the show, mouthwatering desserts of chocolates and gingerbread, waking up on Christmas day for your gifts from Santa Claus. But aside from the colourful decorations, the jolly carols chirping through shopping mall speakers, the stories of Rudolph the Red Nosed Reindeer, the socks stuffed with sweets, to the sweet peppermint taste of candy canes, what exactly is Christmas and how did this sacred day come to be? Although all what makes Christmas fun is important to us in this era, one should not forget to acknowledge the true meaning of Christmas that might change the way you see Christmas day and perhaps make all this celebration even more, well… meaningful. As a lot of you probably already know, Christmas was originally celebrated as the birth of Christ marked by the western church in the 4th century which falls on the same day as the pagan Roman celebration of Saturnalia. Earlier to this date, there were many controversies regarding the year, date, and time of Christ’s birth. Although the church itself reveres Christ’s latter events in his life as a more significant date, Christmas has established its popularity among the modern masses – both Christian and non-Christian – from all the extra accessories which makes Christmas so much more “festive” than just simply feasting in the honour of Christ. These “accessories” being the tall Christmas tree families spend a day putting up and decorating, ultimately to use as a base of gift giving on Christmas day – this was actually adopted by the pagan religion that worshipped trees which was adopted by the church. 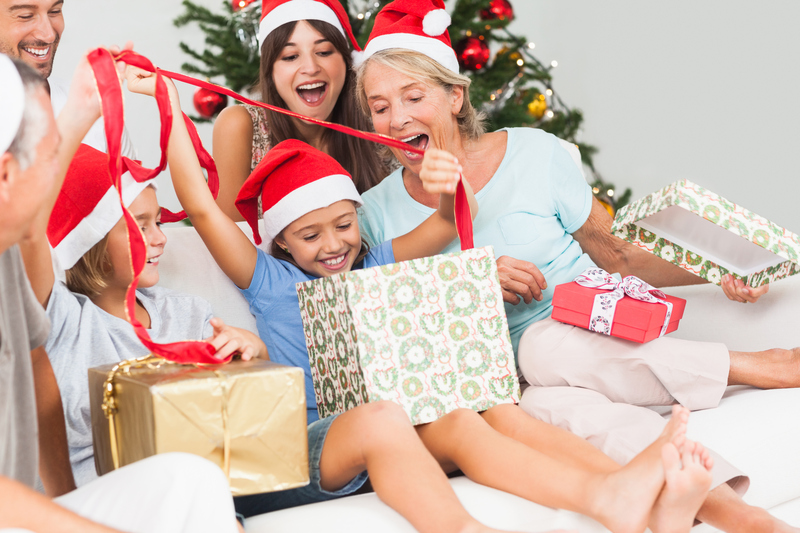 How about the beautiful presents under the tree that make just about every child’s holiday? This was actually inspired by Saint Nicholas, a Greek Christian renowned for his generosity to those in need. And who exactly is Santa Claus? Known as a big man in a red suit with a white beard riding on a sleigh of reindeers, Santa Claus is a mythical being who travels from his “factory” of elves to deliver your presents by climbing down a chimney. Akin to the exact date of Jesus Christ’s birth, the origins of Santa Claus has some obscurities ranging from Saint Nicholas to ancient Germanic folklore but is believed to primarily be inspired by the Dutch “Sinter Klass” who delivers presents to well-behaved children on Christmas Eve. So what can we learn from this brief history on Christmas? We can learn that all the decorations, the feasting, the presents, basically everything we love about Christmas, has one significant meaning that will change the way we celebrate the birth of Christ which is the fact that giving is the true meaning of Christmas. A lot of people anticipate the 12 days of Christmas as a period where they can kick back, have fun, and receive new gifts along the way but the essential core to a happy Christmas is loving one another and giving something to each other. Be it in the form of presents or hearty meals or even both! 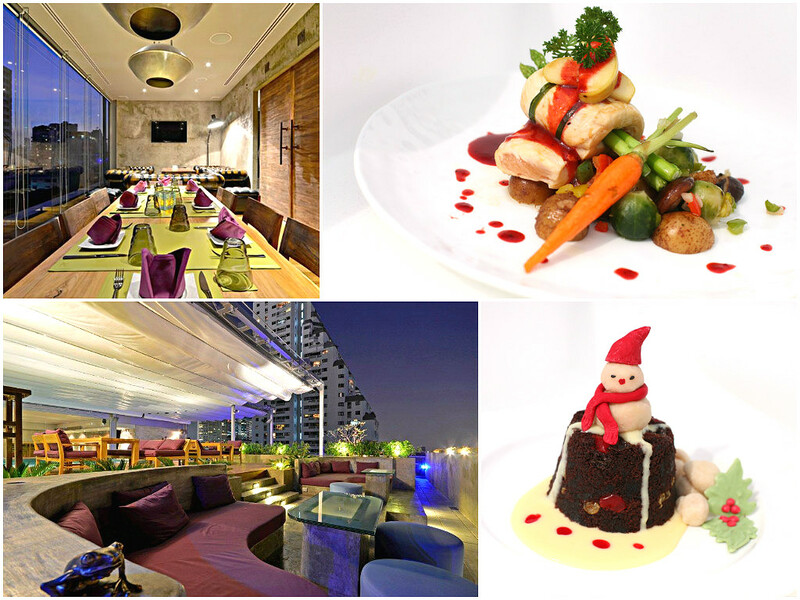 An Italian restaurant on the 35th floor of The Continent Hotel Bangkok near the Asok BTS station, the Medinii restaurant usually serves a buffet breakfast, buffet lunch/brunch and a la carte Italian dishes in a luxurious atmosphere against the backdrop of the Bangkok city skyline. 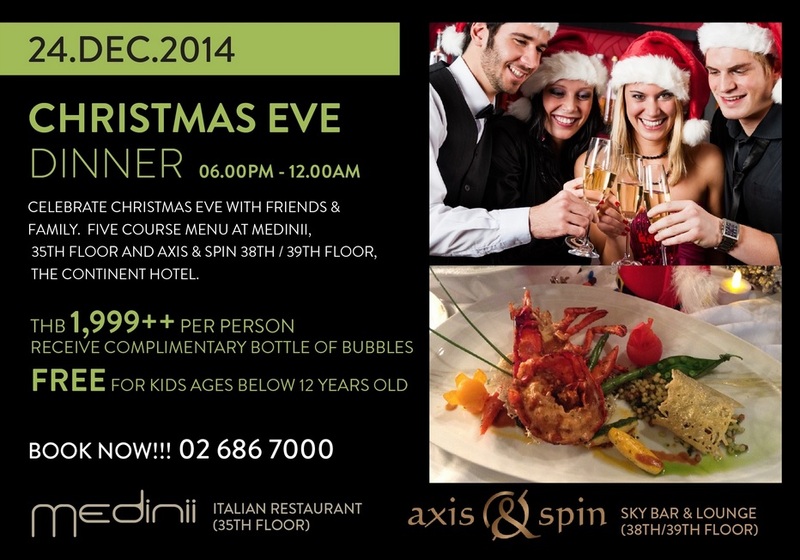 As a special gift to those who aren’t so confident about their cooking skills, Medinii offers a special Christmas Eve 5-Course Set Dinner on December 24, 2014 where you can choose between a main dish of Pan-Seared Snow Fish Tomato Confit or the Best End of Australian Lamb with a free bottle of bubbles. To highlight the season giving, kids under the age of 12 gets to eat the kid’s menu for free where they can choose a main course of either Steamed Seabass served with sweet corn puree, ratatouille and brown ginger or Grilled Herb Crusted Pork Chop with forest mushrooms and roasted potatoes served with whole grain mustard sauce! 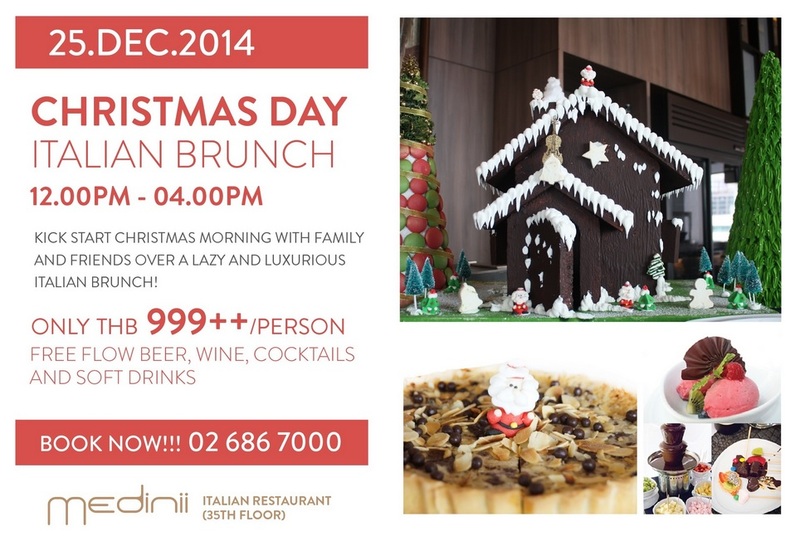 If you by any chance decided to give cooking a Christmas Eve feast a try, Medinii also has a Christmas Day Italian Brunch you can treat you and your family to after opening your gifts in the morning. Because Christmas a season of giving to loved ones and celebrations, we do recommend that you reserve a table in advance by calling 02 686 7000 to avoid fully booked tables, you can also ask for any information you might wish to know by contacting this number. Another option would be the Leapfrog Bar & Grill on the rooftop of the Galleria Ten Hotel in Sukhumvit Soi 10, near the Nana BTS station. Usually serving an international menu inspired by different cuisines around the world, the Leapfrog Bar & Grill has organised a 4-Course Set Dinner to also give to those who just can’t get that turkey done right. 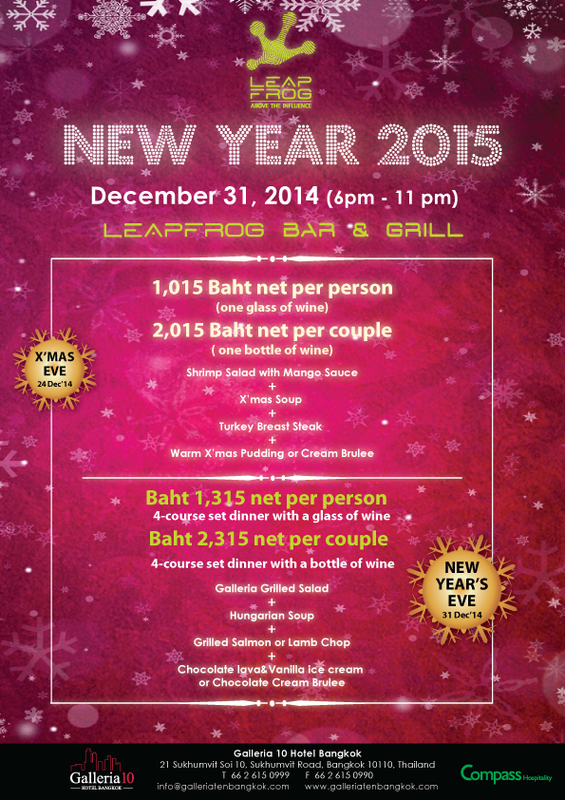 Again, we strongly recommend that you make reservations in advance, you can simply reach them at 02 615 0999. 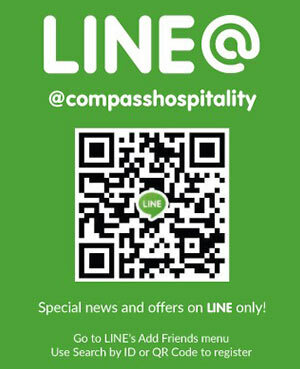 If you wish to dine in the bustling party street of Sukhumvit Soi 11, the L3 Eatery of the Le Fenix Sukhumvit Hotel has a 3-course Set Dinner where you can choose a main course of either Grilled Australian Beef Tenderloin Steak or Grilled Chicken Breast stuffed with spinach and cheese for THB 899 net per person. Christmas is a time for giving and cherishing our loved ones and what better way to do that than to dine deliciously with each other? 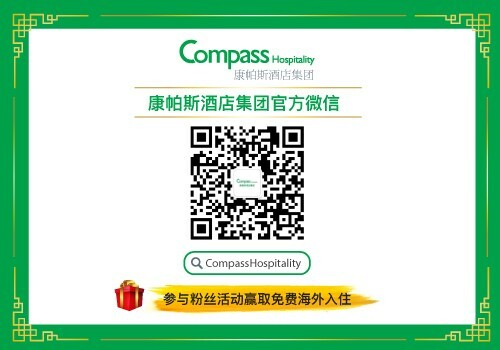 For as James Beard states – food is our common ground, a universal experience, a fulfilling dinner is among the best gifts you can give a loved one this Christmas. 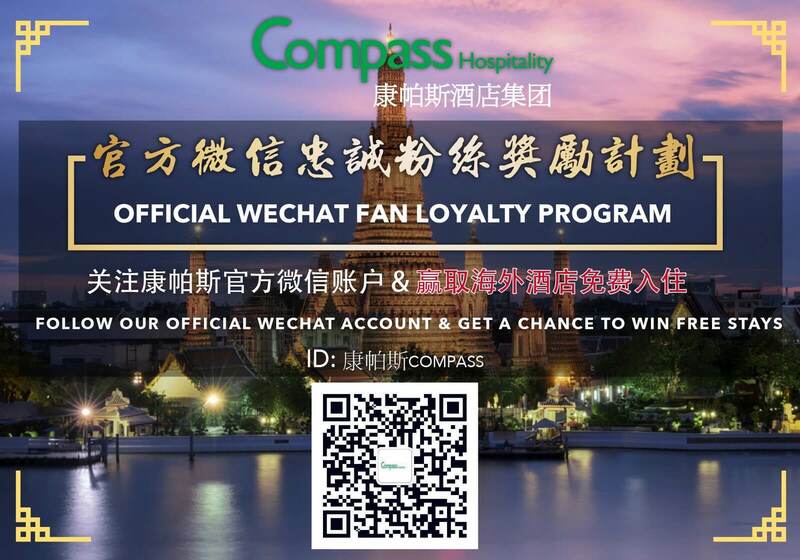 For more details on the sights and sounds around Bangkok, feel free to follow us at Compass Hospitality!